1 Heat the oil in a large frying pan. Add the chicken and cook on high heat for 3-4 minutes each side, until the chicken browns. 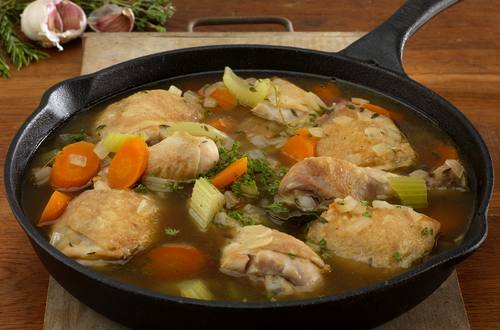 2 Place the chicken legs, carrots, onions, garlic and celery into a large saucepan, add the Knorr Chicken Stock, making sure to completely cover all of the ingredients. 3 Add the bay leaves, rosemary and bring to the boil. Reduce the heat, cover and simmer for 50-60 minutes. 4 Sprinkle generously with thyme and season to taste with black pepper.